Turn the ignition switch to lock. 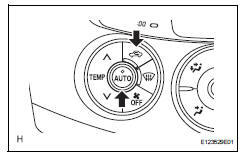 Turn the ignition switch on while simultaneously pressing the a/c control auto switch and the rec/ frs switch. Check that all indicators and the display area are turned on and off 4 times in succession at 1 second intervals. After the indicator check is completed, the system automatically enters sensor check mode. Press the off switch to terminate the panel diagnosis. Press the rec/frs switch to enter actuator check mode. After the actuator check is completed, press the auto switch to enter sensor check mode. The sensor check must be performed again after the actuator check is completed because sensor check mode, which starts automatically after the indicator check, cannot fully detect malfunctions. Check the sensor check results displayed on the set temperature display. 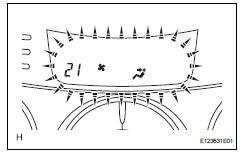 The illustration shows the display when code 21 is output. When 2 or more sensor check codes are detected, the codes are displayed in ascending numerical order. In cases with 2 or more codes, if they are difficult to read, press the def switch to activate the step operation and display them one by one. The codes are displayed in ascending numerical order as the def switch is pressed. When any sensor check codes are displayed, refer to the dtc chart (see page ac-39). Pressing the rec/frs switch returns the system to actuator check mode. Inspect, and repair or replace the malfunctioning parts. Clear the sensor check codes. While pressing the def switch during sensor check mode, press the rr def switch. Sensor check codes can be cleared by removing the ecu-b2 fuse from the engine room no. 2 Relay block for more than 60 seconds. Perform the sensor check and confirm that normal code 00 is displayed. Start the engine and warm it up. When the sensor check is started after the indicator check, press the rec/frs switch to start the actuator check. Perform the actuator check with the engine running. Check the temperature and blower levels by hand at each step while the actuator check proceeds from step 0 to 9 at 1 second intervals (continuous operation). Each step number is displayed on the set temperature display. To display step numbers one by one manually, press the def switch to activate the step operation. The step number changes each time the def switch is pressed. 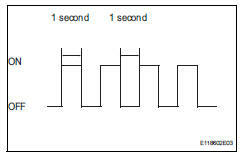 Each step number blinks at 1 second intervals during the step operation. The illustration shows the display when step number 5 is displayed. Pressing the auto switch returns to sensor check mode.